doledrumdiva | The diary of a doledrum diva and her adventures in alimentary alchemy….all on twenty quid a week…. 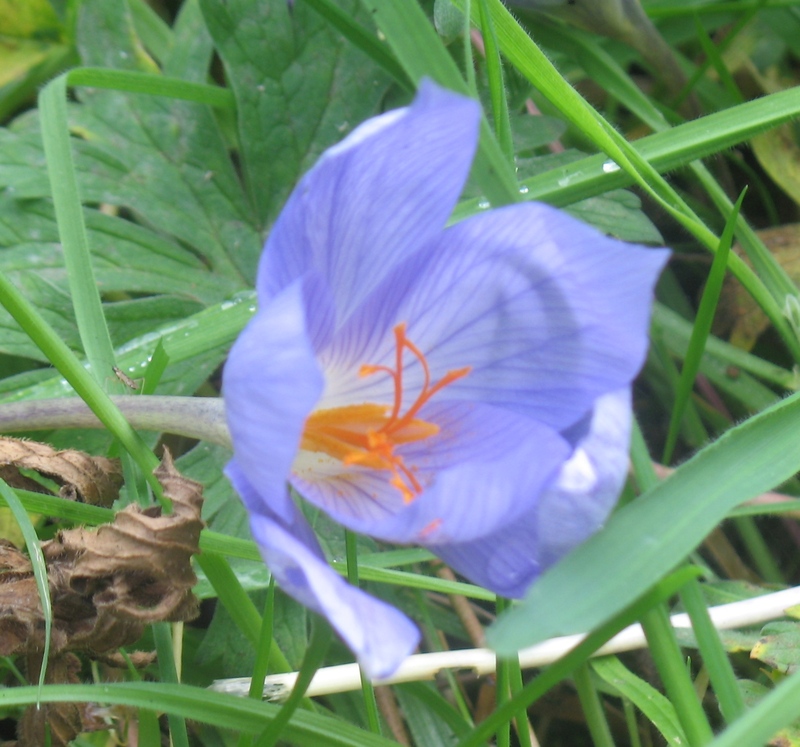 Some blessed and enlightened gardener(s) planted up patches of one of my local parks with saffron crocus – Crocus Sativus and they flower for a period of two precious weeks at the end of October, each flower lasting just a day. There are other autumn crocuses, from the colchicum family that flower earlier in September through to December, but they aren’t edible, (in fact some, such as naked ladies, are highly toxic – so be warned)…..the stamens are usually quite obviously different. True saffron crocuses have 3 stamens, whereas the colchicum family (as they’re really from the lily family) have 6, and the stigmas and stamens often (but not always) look very different. You want to collect stigmas.There is some difference in colour, from strong orange to deep crimson in true saffron – if you’re not sure, read a few reliable guides, but when stigmas are dry, the smell of saffron is unmistakable. UPDATE – spent some time chatting to a gardener who specialises in native British planting the other day, and he told me the stigmas from colchicum family can also smell of saffron when dried, as they also contain safranal – the best way to exclude a poisonous naked lady is to check for leaves – naked ladies don’t have any when they flower (they produce leaves in the spring, when they sometimes get mistaken for wild garlic – which is when most cases of poisoning occur – sometimes fatal). Crocus leaves are long thin spikes, darker than a blade of grass and slightly glossy. I went to back to the park to take a better picture, but the municipal gardeners have mowed 😦 however, found some naked ladies planted in the local ecology park so have posted a picture at the end of this post. Saffron is always planted by humans, whereas naked ladies also appear in the wild, especially in the southwest of England. As with some wild mushrooms, the flavour gets stronger as the stigma dry – I place mine in cigarette rolling papers as I pick – use a similar sort of paper as tissues would absorb too much of the precious flavour. Personally, I love love love saffron, but I usually collect about 30 stigmas – enough for 4 or 5 dishes a year – it’s a luxury and it would somehow feel sacrilegious to treat it with less than reverence. If I need more, I buy it. Bulbs are available for sale (and get planted) from June – you can earn serious brownie points with your favourite gardener for the price of a few bulbs. I’m not sure how far north they flourish in the UK – see the wikipage for growing conditions . If you have to eek out small amounts of saffron in a recipe, I recommend you augment it with anatto seeds (from the lipstick plant) soaked in hot water or brown onion skins boiled in water, as they both give a lovely colour and no discernible flavour. Turmeric, while a lovely shade of yellow and a brilliant spice in its own right, has a very strong flavour which will annihilate your saffron. I’m not apologising for my silence – I’m sure you’ve been too busy to notice, but more that I might post in splurges while I catch up…so, the list below will grow links as the evening progresses…. Mother Nature seems to being having splurges too (maybe it’s our age) 😉 – so some things are early (mulberries and blackberries), some things are going at normal speed (fennel seeds and mushrooms), some things have done really badly because they flowered before the cold snap (plums, peaches, almonds and I fear, sloes) and some things have gone overboard with their bounty (cherries, nasturtiums, grapes and cobnuts)…and I found 2 sprigs of blossom on my next door neighbour’s pear tree this week….which is just plain abnormal. When I first started growing things, I never had much luck with lettuces – they either got totally slugandsnailed or I ended up with too many and got sick of the sight of them. My friend B made me this soup several years ago, and together with a Chinese recipe for braised lettuce with oyster sauce, I am no longer put off by the thought of a glut – ‘though I’m still struggling with the slugs. This is the essence of summer in a bowl, for those days when we have a hot spell and even if you water twice a day, all the lettuces threaten to bolt and turn bitter overnight or, as has just happened down at the community garden, a heavy summer storm has beaten them up really badly. It’s not unlike petit pois à la française as a puréed soup, but the mint gives it an extra zing. You could of course, use your own homegrown peas – I usually only grow mangetout, so I use frozen peas, which also need less cooking. The proportions can be pretty flexible, but if you’re using an iceburg lettuce, it’s probably a good idea to be more generous with the peas and mint, ‘cos they can be a bit bitter. If you are using homegrown peas, then after you’ve shucked them, boil the pods in the water for about 10 minutes for more flavour in your stock. Strain and use. 1 onion, or 3 – 4 spring onions, finely chopped. 2 generous handfuls of frozen peas/petit pois – or homegrown, as young as possible. Over a low heat, sweat the onion with the salt and oil, until softened. Add the lettuce and wilt for a minute or two, add water, bring to the boil and add the peas. Cook until tender, but still bright green. Turn off the heat, add mint leaves, and whiz or put through a mouli. Taste for seasoning and serve. Well, I risk you all laughing at me for just discovering something that the Southern states of the USA have known for years, but I really didn’t know you could make tea with cold water…but there’s a rose pouchong from Taiwan that you should only make with cold water. That, and a lovely tea from Japan called genmaicha (if you can’t find it or it’s too expensive, wikihow has a link making it from scratch here, it is green tea with toasted brown rice – known in Japan as the people’s tea) are both really mellow and non astringent chilled – with no sugar, which in this lovely weather is not only desirable but nigh on essential…. 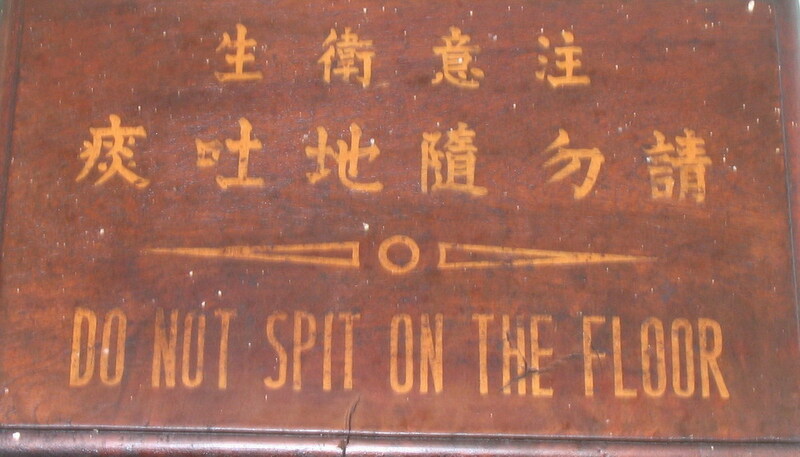 The other thing I find in hot weather is that when I go out, I have a dreadful habit of drinking my trusty bottle of water all in one go – so then I need to find a public loo, and get tempted to buy more…in Beijing (and I’m sure in other places too, it’s just I try to visit hot places in cooler months, so I’ve only seen it in Beijing), they sell bottles of water not chilled, but frozen….which means it can last you for hours in small chilly sips, and you have something cold to hold …if you’re freezing your own, don’t overfill the bottle and try and freeze it standing up. link to lovely frivolous pix of sugary talent, creativity and serious dollops of skill! I will add actual pictures of this recipe later today or tomorrow – but it’s a bit too hot to be cooking caramel in the daytime at the moment. ‘….Caramelization is what happens when sugar melts. A crystal of granulated sugar, scientifically called sucrose, is held together by chemical bonds, but energy from heat can break these bonds, splitting the crystal into its two component sugars, glucose and fructose. These sugars break down further, freeing their atomic building blocks: carbon, hydrogen and oxygen. Hydrogen and oxygen atoms reunite to form water, and the carbon clusters in increasingly larger clumps. Eventually the water evaporates and the carbon starts to burn. There’s a couple of things that it’s good to think about before you start. By all means use a sugar thermometer if you have one, but you don’t need one. It is actually v. easy to make with no fancy kit- I made my first spun sugar when I was 13, when I was bored and I’d been left alone in the house for a few hours….and we had no gadgets at all. If you have a pan with a light coloured inside, it will help you catch the syrup before it starts turning golden, but it’s probably more important to use your heaviest bottomed pan to stop it burning too quickly. Sugar gets very hot – in fact, you’re taking the syrup up to ‘hard crack’ stage, which is about 155 degrees celius/315 degrees Fahrenheit, so do take care and make sure small curious children are out of the way. You can make caramel baskets/shapes without the cream of tartar, but the strands will be thicker and the caramel will be dark(er). As well as your pan, and a clear work space, you will also need a small glass of cold water (especially if you have no thermometer), plain vegetable oil for greasing handles of wooden spoons (for making curls and spirals) and greasing the outside of a metal bowl (for making cups and baskets)…..you can also make free-er form shapes on greaseproof paper. For spinning fine strands, I use a fork. If your pan is not particularly thick bottomed, it’s quite a good idea to half fill the sink with cold water, so that you can take the pan off the heat and place it in the sink to arrest the cooking before it burns. Finally, something I always used to do was make too much – the ratio is always 2:1 sugar to water and a pinch of cream of tartar – 100g of sugar and 50ml water makes loads. Pinch of cream of tartar – it can be a meanish pinch for this amount, a normal pinch if you’re making more. Glass of cold water on the side. Place water and sugar in a pan and stir before you put it on the heat. Place over a medium to high heat to dissolve the sugar – DO NOT stir at this point as you’ll make the sugar recrystallise and go all grainy. Bring to a hard boil, and after a couple of minutes, drop a little droplet into the water in the glass with a teaspoon – when this goes hard straight away, it is done. Hopefully you will be able to catch this before it starts going golden – unless you want it to be golden. Take off the heat and add the cream of tartar, stir a couple of times and then you are ready to spin. Dip a fork in the syrup and swirl around your greased mould or gently swirl onto greaseproof paper, touching already formed strands from time to time to create your desired shape. The quicker you swirl, the thinner the strands. Leave to cool and harden before gently prising off the mould. Don’t make this too far in advance or put it in the fridge, as the moisture will soften the structure. Guardian article here…..while it’s great that they’ve seen the light, do they really think it’s going to change anyone’s voting habits, especially when it’s something people have been thinking and (quietly getting on with) doing for years. I think I’m right in saying local councils have had a legal duty to supply allotments since 1909. Fair enough, some official ‘approval’ is always useful….but, still, talk about stating the bleeding obvious.